Nautical by Nature: Angela Moore Bracelet Giveaway! The winner will receive the pink and green She Sells Seashells bracelet from Angela Moore! I like the breast cancer awareness earrings. I like Angela Moore on FB and follow on Twitter. I also follow your blog. 1. I like Angela Moore on Facebook. 2. I follow Angela Moore on Twitter. 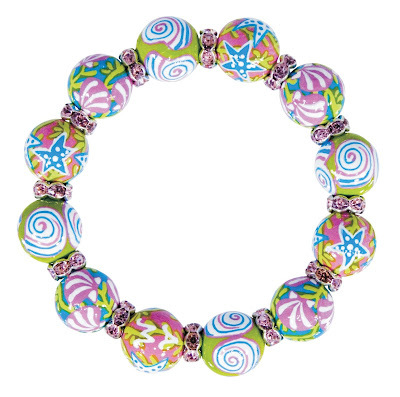 I really like the pink grapefruit necklace and bracelet. Loving orange and pink together! I like the city rose and country rose bracelets. I love the pink grapefruit bracelet! Well I actually love the one on here the most but the Peppermint Pop Classic is my close second favorite. They are all pretty fabulous though! I like Angela Moore on FB. Right now I am really loving the Twelve Days of Christmas bracelet! I love the carly dress! I follow Angela on twitter! My pick for the favorite item would be the matching necklace of the She Sells Seashells with light pink crystals. So adorable! BroncoMom follows Nautical by Nature. The Angela Moore facebook site has been "liked" by me. LOVE the apple blossom classic in pink and green! I really like the vases. I particular the LOTUS POND VASE. Thanks for a great giveaway, Kate! My fave is pastel sitting pretty bracelet. I'm a blog follower. 1. I liked Angela Moore on facebook. 2. I followed Angela Moore on Twitter. 3. I am following this blog. 4. I will tweet about this giveaway - jewellery is cool! 5. I like the Busy Bee's Classic Bracelet best, I think. 4. I follow your blog. 1.I'm a follower of your fabulous blog. 2. I have been on the lookout for a cool, new dog collar. I found one that I love:the Go Fish! (in Tree Hugger). I follow your wonderful blog and I like Angela Moore on facebook. My favorite is definitely the Love That Lobsta in the petite bracelet because I have freakishly small wrists! What a wonderful giveaway! Thank you! I LOVE the Love that Lobsta pendant for my sister who collects Lobsters! Favorite product/pattern is the purple peonies classic bracelet with gold! I like AM on Facebook. I follow AM on Twitter. And follow this blog, AM on twitter, and facebook. (I think that's three more entries.) Thanks for the giveaway! I love the Pink Grapefruit Jewelry collection! I liked AM on FB, following AM on Twitter, follow your Blog, Tweeted the giveaway (@LuluDaisy). Love Angela Moore! I love the Fleur de jour bracelet. So pretty! I'm a follower! Really like the Love That Lobsta bracelet-- would go perfectly with a skirt I picked up from L.L. Bean at the end of last season! I love the "LOVE THAT LOBSTA CLASSIC BRACELET W/SILVER"
AND I posted info about Angela Moore and the Giveaway on Facebook! 1. I love the glamour puss earrings. 2. I liked Angela Moore on FB. 5. I followed Angela Moore on Twitter. I like beachy things, so the Beachcomber and She Sells Seashells Classics are my fave. I like the bracelets. I liked Angela Moore on FB. when did Angela Moore start selling clothes? love the Carly dress and I REALLY love the love that lobsta necklace. I love the Preppy Perfect classic bracelet. I also love the pink giraffe, though! Love the bracelet in Flip Flops and Bermuda Bay. Big fan of Angela Moore!